Carrie-Anne Moss (born August 21, 1967) is a Canadian actress. Moss started her career on television, but became famous for her character, Trinity, in The Matrix trilogy. 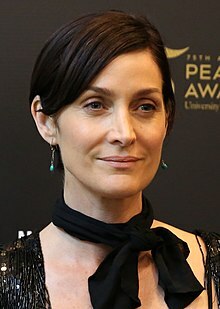 Carrie-Anne Moss was born in Burnaby, British Columbia. Her parents are Barbara and Melvyn Moss. She has an older brother, Brooke. Moss' mother reportedly named her after The Hollies' 1967 hit song, "Carrie Anne", which had been released in May that year. Moss lived with her mother in Vancouver as a child.[source?] At the age of 11, she joined the Vancouver children's musical theatre and later went on to tour Europe with the Magee Secondary School Choir in her senior year. ↑ Lee, Alana (3 November 2003). "Carrie Anne Moss: The Matrix Revolutions interview". BBC. Retrieved 3 September 2017. ↑ "Baby Boom". People magazine 60 (20). November 17, 2003. ISSN 0093-7673. http://www.people.com/people/archive/article/0,,20148623,00.html. Retrieved 2009-06-07. ↑ Nayman, Adam. "ELLE Interview: Carrie-Anne Moss - Elle Canada". ↑ Dave McNary (April 22, 2015). "Documentary 'Unity' Set for Aug. 12 Release with 100 Star Narrators". Variety. Retrieved May 1, 2015. This page was last changed on 23 April 2019, at 11:00.